Futures for the Dow Jones today (Tuesday) forecasted an 89-point gain from yesterday's close as Greece's debt deadline nears and investors hope for a last-minute deal. This morning, the European Commission pleaded with Greek Prime Minister Alexis Tsipras to accept a bailout offer that his country has previously rejected. On Monday, the DJIA cratered 350 points as traders sold on fears that Greece may default on its debts. The nation shocked European Union ministers over the weekend by announcing no intentions to pay debts due on Tuesday and plans to allow its citizens to vote on a referendum over whether the country should accept the EU's debt conditions. Yesterday, all three major U.S. indexes fell more than 1% for the first time since May 26. The S&P 500 slumped more than 2%, while the Nasdaq fell 2.4%. The Stock Market Today: This morning, investors will weigh a busy morning of economic data that includes the S&P Case-Shiller Index and Consumer Confidence. But today, the bigger deal is what's happening across the Atlantic Ocean. Greece is now just hours away from defaulting on a 1.5 billion euro ($1.7 billion) loan from the International Monetary Fund. 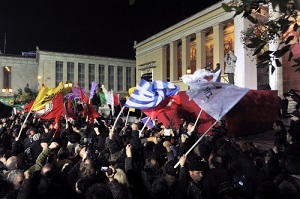 Yesterday, Greek officials said they will not meet the deadline and will instead turn to voters. Oil Outlook: Oil prices were near a three-week low as the closure of Greek banks fueled a sell-off in energy commodities and energy stocks. This morning, WTI August oil futures ticked a bit higher, up 0.7% to hit $58.75 per barrel. Brent oil gained 1.3% to hit $62.85 per barrel. Earnings Reports: Companies reporting earnings this morning include ConAgra Foods Inc. (NYSE: CAG), Greenbrier Company Inc. (NYSE: GBX), Star Bulk Carriers Corp. (Nasdaq: SBLK), and UniFirst Corp. (NYSE: UNF). Pre-Market Movers No. 1, MSFT: Shares of Microsoft Corp. (Nasdaq: MSFT) added 0.8% in pre-market trading on news that the firm plans to exit the ad-sales industry. The company announced plans to contract AOL Inc. – which is being purchased by Verizon Communications Inc. (NYSE: VZ) – to handle its advertising. In addition, Uber Technologies Inc. said it plans to purchase the firm's street and 3D imaging and 3D views from Bing Maps. Pre-Market Movers No. 2, APOL: Shares of Apollo Education Group Inc. (Nasdaq: APOL) cratered more than 11% in pre-market trading after the owner of University of Phoenix reported weak third-quarter earnings and saw enrollments slump. The firm said its earnings fell 27%, while enrollments plunged 13%. Pre-Market Movers No. 3, JUNO: Shares of Juno Therapeutics Inc. (Nasdaq: JUNO) surged more than 33% on news that Celgene Corp. (Nasdaq: CELG) will spend roughly $1 billion over the next decade to partner with the biopharmaceutical firm to develop treatments for immune system-based diseases. The two firms said that these treatments would be available to patients by 2020. Shares of Celgene were down 0.4% this morning. Stocks to Watch No. 1, AGO: Bond insurance companies took the biggest hit today, but it wasn't just Greece causing crisis in their board rooms. Yesterday, Assured Guaranty Ltd. (NYSE: AGO) dropped more than 13.3%, while rival MBIA Inc. (NYSE: MBI) slumped more than 23.4% after both companies received downgrades on concerns tied to Puerto Rico's debts. Puerto Rico's government owes $72 billion; however, the island territory's governor, Alejandro Garcia Padilla, said it could not meet its obligations. That has rattled the bond markets, as many municipal funds own Puerto Rican bonds due to their tax favorability. Stocks to Watch No. 2, PNR: Shares of valve and pump maker Pentair Plc. (NYSE: PNR) were up more than 4.7% this morning on news that activist investor Nelson Peltz's hedge fund, Trian, has taken a 7.24% stake in the firm. According to reports, Peltz has discussed the company's future with its CEO, and the hedge fund would like to see Pentair purchase several rivals in order to consolidate the industry. Stocks to Watch No. 3, QCOM: Semiconductor giant Qualcomm Inc. (Nasdaq: QCOM) is in focus after its CEO said the firm is not planning to spin off its chip manufacturing business from its patent-licensing division. The firm has come under pressure from activist hedge fund Jana Partners, which recently called the chip division at Qualcomm "essentially worthless." Consolidation within the sector has accelerated in recent months. S&P Case-Shiller HPI at 9 a.m.